The incomparable guitar genius & firebreathing intensity of TED NUGENT have carved him a permanent place among the legends of rock. Hailing from Detroit, the guitarist's prodigious talents, earshattering volume & over-the-top onstage antics quickly earned Young Ted the moniker of "Motor City Madman," along with international acclaim. 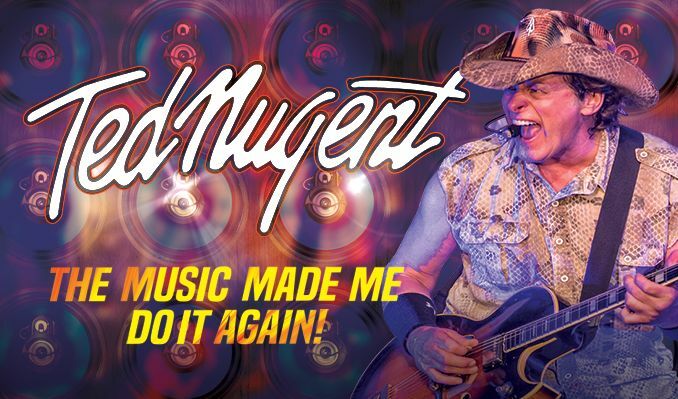 Recognized as the world's leading guitar showman, NUGENT'S no-holds-barred career spans five decades of multi-platinum hits. From the ground breaking Amboy Dukes' "Journey to the Center of the Mind," to classics like "Stranglehold" & "Cat Scratch Fever," Damn Yankees chartbusters like "High Enough," and cult classic "Fred Bear," TED NUGENT'S rapidfire sonic assaults continue to sell out venues around the globe. The sounds he wrings from his almighty Gibson Byrdland leave audiences gasping for breath & begging for more. To millions of guitar lovers everywhere, TED NUGENT is rock & roll.